Successfully Added 1.3 Inch Watch Phone - Heart Rate Monitor, Calorie Counter, Pedometer, Sedentary Reminder, Sleep Monitor, Bluetooth, 1 IMEI to your Shopping Cart. Conveniently make and receive phone calls, send out messages, and receive social media notifications with this stylish smart watch phone. No longer will there be the need to dig through your bag and physically have your smartphone at hand in order to make phone calls or send out a text message – with this smart watch you can enjoy all your smartphone’s features straight from your wrist. 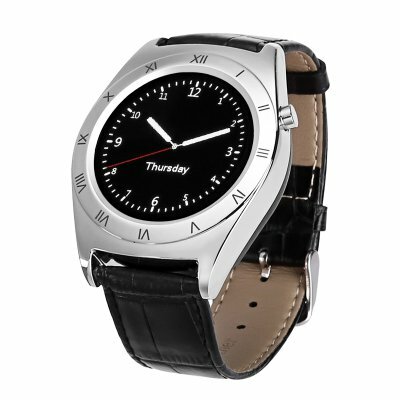 Featuring a stylish design, this watch phone can be worn with confidence at any occasion. Whether you head out to the gym, attend a birthday party, or take part in an important conference – this fashionable smartwatch is guaranteed to suit any style. Simply slide in a SIM card and you will be all set to enjoy all the features this gadget brings along. Make and receive phone calls, send out messages, update your social media, and even remotely control your smartphone camera – with this watch phone your options will be limitless. Featuring a beautiful 1.3-Inch IPS display, it will portray vivid color and stunningly sharp visuals – allowing you to enjoy your watch phone’s features even while outside in direct sunlight. Additionally, it features an anti-loss feature that, when paired with your smartphone, ensures that you’ll never again lose track of your beloved smartwatch. Besides bringing along the basic smartphone features this phone watch also comes packed with a hand full of amazing health features that help you work towards a healthier future. Featuring a pedometer this little smart accessory keeps track of all your daily movement, allowing you to reach your activity goals. A calorie counter additionally shows you the energy that you have burned throughout your past workouts and an accurate heart rate monitor is in place to keep you constantly updated about your current conditions. This sport watch furthermore features a sedentary reminder through which it motivates you and ensures you’ll never miss a workout again. Finally, the watch's sleep monitor will make sure that you’ll get enough rest and sleep after each intensive workout – guaranteeing the fastest and best recovery for your body. Packing a 380mAh battery this sports watch phone delivers up to 2 hours of continuous usage time, enough to get you through the most demanding of work outs. Additionally, its Bluetooth feature allows you to pair your watch with a set of Bluetooth headphones, letting you enjoy your favorite tracks during your upcoming workouts or while simply on the move to reach your next destination.